Michigan Association of School Boards' Dr. Michael Emlaw, left, helped the Ypsilanti School Board narrow its superintendent search from 17 to seven at Monday evening's meeting. Mar. 31, 2009 · 2:49 p.m. 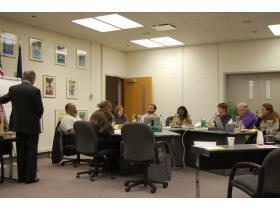 The Ypsilanti School Board whittled down the number of superintendent applicants Monday night, taking another step closer to hiring a new one. The board received 17 applications for the open position, which were initially sent to the Michigan Association of School Boards in Lansing, the firm hired to conduct the superintendent search. Dr. Michael Emlaw, of the MASB, assisted the board in its final decision regarding whom to interview. Each member of the board listed their top choices and Emlaw tallied the results. The board is scheduled to interview Derrick R. Coleman, assistant superintendent of Detroit Public Schools and Dr. Linda S. Hicks, superintendent of Redford Public Schools. Also on the list are Dr. Benjamin P. Edmondson, principal of Scarlett Middle School in Ann Arbor; Dr. Sandra J. Harris, superintendent of the Oak Park School District; Dr. Theresa E. Saunders, superintendent of East St. Louis District #189; Richard A. Weigel, assistant superintendent of Ypsilanti Public Schools; Dedrick D. Martin, executive director of equity and achievement for Champaign Unit 4 Schools in Champaign, Ill.
Not every board member was pleased with all of the choices. Trustee Andrew Fanta initially voted for none of the candidates. Fanta added, if the board wasn’t pleased with any of the candidates, they should consider taking on another interim superintendent and re-posting the position. Trustee Edward Jackson agreed the list of candidates wasn’t outstanding, but did like some of them. “It didn’t look like an A+ list to me, but I thought there were some good people,” Jackson said. President David Bates was more impressed with the quality of the candidates. Bates expressed concern about the possibility of re-posting the position, which Fanta first proposed. Emlaw initially recommended the board offer the two out-of-state candidates a $400 stipend for traveling expenses, saying it would be a generous and gracious gesture. Fanta disagreed with Emlaw’s suggestion, citing the current economic situation. Emlaw withdrew his suggestion before the board made a motion to accept it. The new superintendent will replace Dr. James Hawkins, who has been serving as superintendent since 2005, following the departure of Dr. David Zuhlke. The board is scheduled to offer a contract on April 27. The new superintendent is scheduled to take office July 1. Derrick R. Coleman, 6 p.m.
Dr. Linda S. Hicks, 7:45 p.m.
Dr. Benjamin P. Edmondson, 4 p.m.
Dr. Sandra J. Harris, 6 p.m.
Dr. Theresa E. Saunders, 7:45 p.m.
Richard A. Weigel, 6 p.m.
Dedrick D. Martin, 7:45 p.m.
All interviews are open to the public and will be held at Ypsilanti High School’s media center.